Earn a great rate, without ever stepping foot into the Bank! As the name implies, you must open, and fund (meaning add money to), your account online. We promise it is quick, secure and painless. We do require you sign up for Online Banking and eStatements within 30 days of opening your account. Online Banking access will ensure you can transfer funds to and from your account easily. You can also use our Free Mobile Banking app to deposit checks directly into your account. The advertised rate is for balances up to $1,000,000. Any amount over this amount will earn a lower rate. For additional convenience, you are invited to open a checking account, through which you can make additional transactions online or at an ATM. 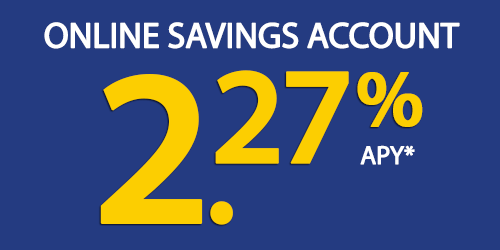 Click here to open an Online Savings Account. For more information or answers to any questions, please visit our Client Service Center, use our Information Request Form, or call us at (508) 820-4000. Learn more about deposit insurance. *Annual Percentage Yield (APY) effective December 28, 2018 and subject to change without notice. Account can only be opened online with a minimum deposit of $10. There is no minimum daily balance requirement to earn APY. All transactions for this account are required to be conducted electronically, i.e. online, ACH, bill pay and mobile. Remaining balances in excess of $1,000,000 will earn a lower interest rate. eStatements and Online Banking are required within 30 days of account opening.